While on my flight home from Belize earlier this year, I realized part of what I love about traveling is how compact life becomes. I also love it when I remember all the little things that help my traveling companions and I to be more comfortable in the airport and on long flights. 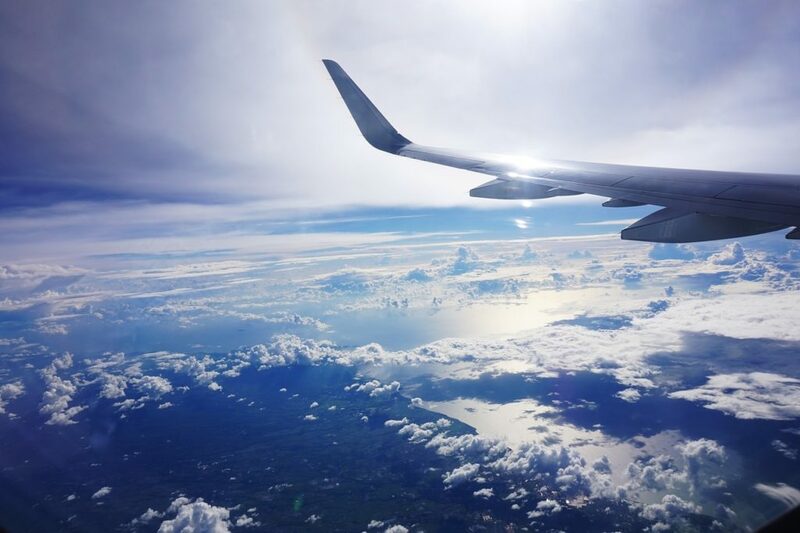 Here are some ways I stay organized at home to keep packing easy, as well as my Happy Traveler Flight Bag supply list, with my favorite in-flight items to ease the stress of airports and flights. The easiest way to ensure you go crazy before you leave on a trip is to have all your travel supplies spread throughout the house and garage. To stay sane, I recommend having just one or two places for travel items. I keep my travel money belt and neck pillow in my suitcase, and my bathroom travel bag is always packed and on the same shelf in my bathroom. For multiple travel bags and suitcases, I try to pack them like Russian dolls – one inside the other, with travel pillows and other travel-only items packed inside. 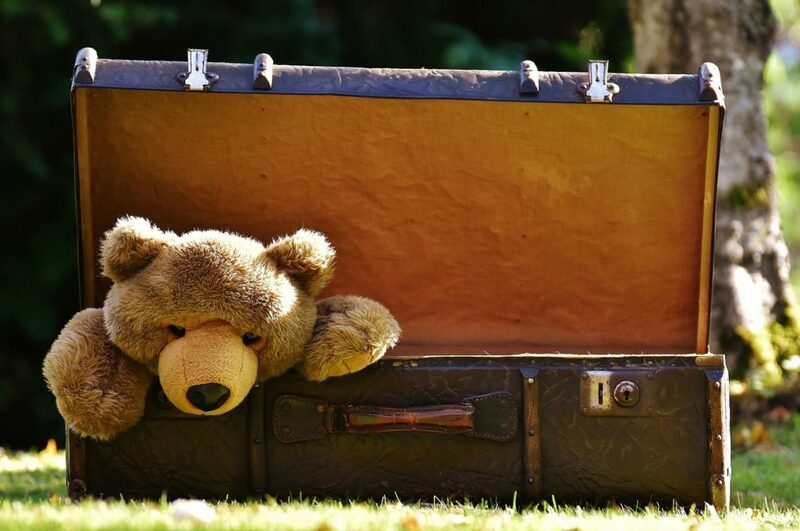 To be super travel savvy, you could put the entire contents of the Happy Traveler list in your favorite suitcase or travel bag so it’s ready to go. Keep your favorite shampoo, conditioner and lotion ready to grab in containers in a double Ziplock for your next trip. Keep the ones you aren’t using on the next trip categorized in other Ziplocks or containers. It can be hard to resist the urge to collect every single tiny travel shampoo, conditioner and lotion you come across! It’s so easy to collect more of these than is humanly possible to use in one lifetime, so think about how many you REALLY need and resist the urge. Periodically go through and purge these when there get to be so many they’re taking over your travel supplies. Throw away any that have less than half left. For overflow full containers, homeless shelters and sometimes food banks often love these if you’re looking for a place to donate them. Contact me if you live in the Kitsap area and would like suggestions as to where to donate. 4. Remember travel hairspray and toothpaste! I have a container with just spare toothbrushes and travel toothpastes, so I can grab one whenever I need to. I like having separate supplies just for traveling all packed up and ready to go in a travel bag (or two), rather than having to take my regular ones. Phone: If you plan to use your phone for connections and navigating in a foreign country, if you don’t have an international travel plan, make sure to call your cell phone company a few days ahead of time to have your phone unlocked for travel. Credit Cards: If you plan to use your credit and/or debit cards while traveling, make sure your bank or credit union knows you’ll be traveling internationally. A quick phone call or visit to your bank can save many hassles. I didn’t do this once, and it lead to a nightmare of phone calls from a remote Malaysian Island! My credit union allows me to use my credit card as a debit card as well, but I have to call to have them set this up before trips. One friend suggests making a copy of your credit cards and passport, then uploading photos of them onto the cloud so you have access to them if yours are lost or stolen. Make sure to include the number to call if you lose your card. You can also give copies to a trusted friend or family member so you can call them for the information. Lotion (in Ziplock bag) – I prefer coconut oil with a little relaxing essential oil. I put this in a double Ziplock bag as it melts at high temperatures. It saves time and hassle to keep all these things all together, either in a suitcase, your carry-on or in a tote labeled TRAVEL. What do you take in your flight bag? And how do you store your travel supplies? I’d love to hear from you! I’d also love your help in creating a travel packing list – what do you take when you travel? Reply to this post or share on our Facebook page to help me compile the list! 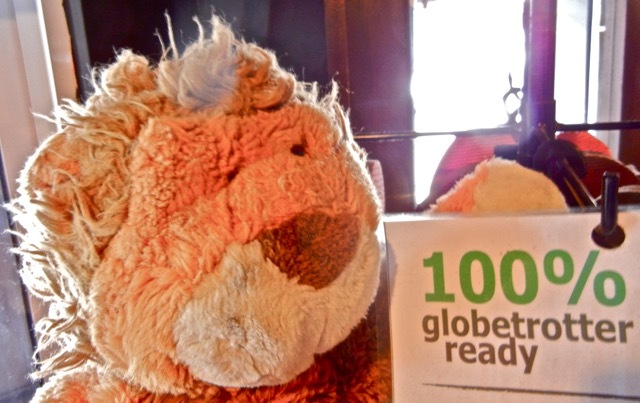 My favorite travel companion, Lumpy the Lion. He’s been to many countries with me and has generated wonderful conversations and much laughter with strangers!